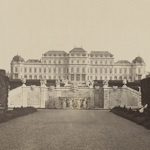 Like most 18th-century buildings in Vienna, Belvedere can look back on an eventful history. The same goes for the art collections. The small ground floor exhibition at the Upper Belvedere traces the chronology that took the location from a sparkle in Prince Eugene’s eyes to today’s world-class art museum. A beautiful wooden model of Upper Belvedere as it looked in 1722, carved in exquisite detail. The curious thing to note is how many lower floor rooms were actually open to the elements. A particular highlight is seeing letters written by Klimt and Schiele. Klimt wrote like he painted, with a distinctive creativity. Pretty sure he would have got marked down for clarity by his German teacher in school. The history exhibition is not Belvedere’s main highlight, of course (cough…The Kiss…cough), but I enjoyed having the palace and collections placed in their historical context. (And that wooden model is a real delight).